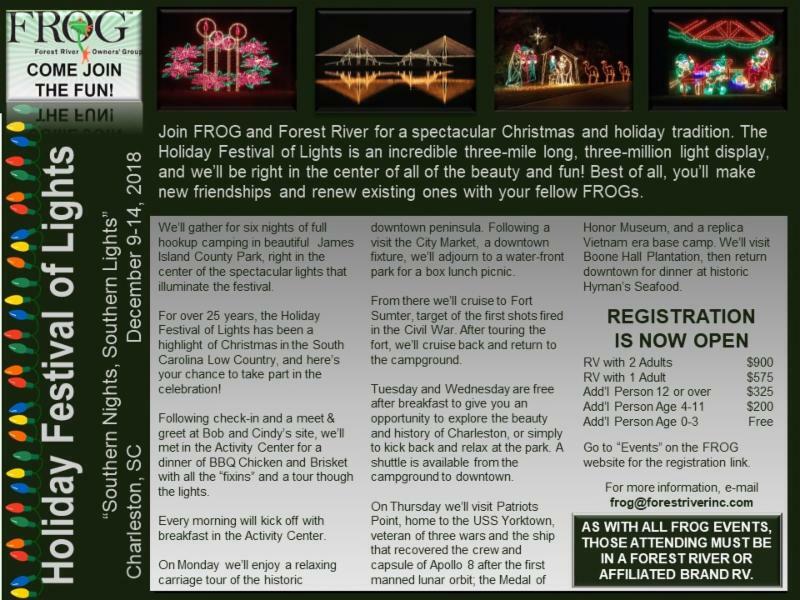 Join us for a FROG tradition -- the Holiday Festival of Lights at beautiful James Island County Park in Charleston, SC. You'll enjoy five nights of full-hookup camping in the middle of a wonderland of 3 million lights in over 600 displays. Towering light sculptures pierce the night sky as you drive through the display or ride the park's miniature train. Occasional live entertainment, gift shop, gingerbread house displays and much more add to the festivities. You'll enjoy a welcome bar-b-q dinner, breakfast each morning, and a seafood dinner (non-seafood items available) at world-renowned Hymen's Seafood. Enjoy a carriage ride in the historic city; cruise the harbor to visit Fort Sumter, site of the first battle of the Civil War; tour the aircraft carrier that survived three wars and picked up the crew of the first Apollo mission to orbit the moon; and much more. Registration will open on Wednesday, June 13 under the "Events" tab on the FROG website, Forest River Owners Group - The official owner's group of Forest River RV, manufacturer of world-class recreational vehicles.. The listing will appear on that day. For complete information, check the picture below, and plan to join us for Southern hospitality, Southern nights, and Southern lights. Did the price increase drastically? I don't remember it being anywhere near $900 when we attended 3 years ago. Gussie, you will look Ken this Rally. We went last year. It was great. Prices have gone up on the campground and on most of the tours that we do in Charleston over the past two years. I do not tow a toad. Is one required? We've attended this rally without a toad and you do not "need" one. Depending on the weather, and what schedule changes FROG Bob makes to compensate for it, you'll have every other day out in a bus. Just make sure you have what you need before parking as the campground store is a bit limited. The campground also runs a shuttle service that will get you close to some shopping if you need it. As Wayne said, you don't need to have a toad. Monday's and Thursday's tours include bus transportation from the campground. If you want to go downtown or go touring on Tuesday or Wednesday, some of our members choose to carpool. The campground also has a shuttle that will take you downtown to the Visitor Center in the morning and pick you up again in the afternoon for a small fee. There, you can catch a free hop-on/hop-of transit system downtown, or pick up commercial tours to many of the other attractions in and around Charleston. Just booked our reservations. Really looking forward to this!